RomeView is an app for iPhones and iPads based on the integration of Augmented Reality, 3D modeling and digital cartography. 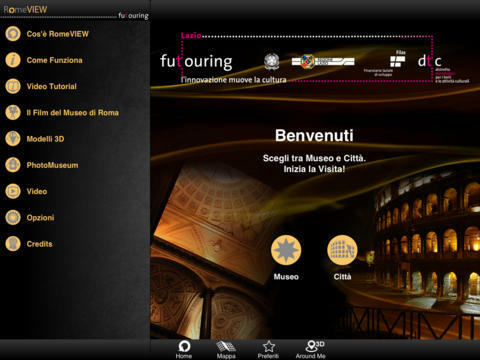 With RomeView, you can enrich your visit to Rome and its museum, the Museum of Rome. You can use it as you walk along the streets of the Eternal City and also when you are in the display halls of the Museum. RomeVIEW can generate customised itineraries for visits and makes the contents of the archives and collections of the Museum of Rome easier to use (text, images, 3D models, historical photographs and video). Then you can go around the city holding the Museum right in your hands. Stadium of Domitian exactly at the spot the famous square now occupies and which gave it its elongated shape. RomeVIEW overlays these reconstructions on the shots you take with the video camera of your iPhone or iPad. In this way, you can see in real time the original appearance of vanished monuments right where they once stood. Similarly, RomeVIEW is equipped with a tool called “PhotoMUSEUM” which, in the same way as the 3D modelling, overlays photographs from the Archive of the photographic department of the Municipality of Rome preserved in the Museum, bringing back to life Rome as it was at the end of the nineteenth century before the clearances and modernisation programmes. 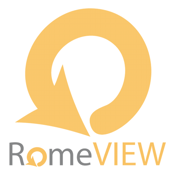 RomeVIEW is also at your side within the Museum. Thanks to Bluetooth™ technology, you’ll always be able to find your location on the plan of the Palazzo and it will also let you obtain information on the works preserved in the Museum simply by pointing your iPhone or iPad towards the item. More than 350 catalogued works, 2,500 images and a room-by-room itinerary or 15 themed itineraries that bring together works which, in addition to their intrinsic artistic value, tell an incredible story. The story of Rome. RomeVIEW, the Museum in the City, the City in the Museum.